Called Fart Watch, the app looks to be a glorified whoopee cushion. The idea is you put your iPhone underneath someone’s seat cushion, then use your Apple Watch to let a fart rip by pushing a big blinking “Fart” button on your wrist. How droll! I suppose we shouldn’t be surprised that fart apps are already in development for the Apple Watch. History repeats itself: When Apple first gave developers the ability to make their own iPhone apps, the proliferation of fart apps on the App Store was, excuse the pun, explosive. My guess? 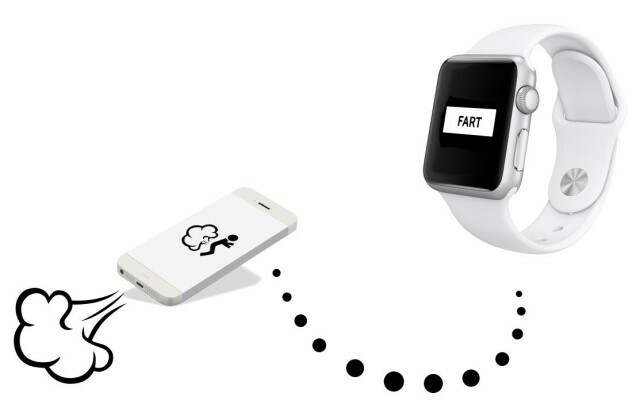 Fart apps will see a resurgence in popularity when the Apple Watch arrives. Fart apps are easy to create — all they need to feature is a button that triggers a sound, which makes them an easy way for new devs to learn WatchKit, the software development kit for Apple’s upcoming wearable. And seriously, never underestimate the potential audience for an app that can make your high-end smartwatch fart. This entry was posted in Apps and tagged Apple Watch, fart watch, watch apps. Bookmark the permalink. Apple may offer personal engravings for Apple Watch.